Danger lurks everywhere. Fires are a daily risk in the oil and gas industry. Valves must cope with extremes in the case of emergency. Components thus need to be fire safe if they are to withstand threatening situations. Everything else would be playing with fire. No wonder demand is increasing for fire safe valves. Losses can be devastating in a case of emergency; therefore, safety is just as high a priority for valves as high quality, and a long life cycle. “Fire safe valves are mainly used in the oil and gas industry, as risk of fire is high,” explains product manager Stefan Keller, AS Schneider. Fire hazards lurk in each step of the process – ranging from oil and gas production to transport, as well as in refineries and storage. The consequences could “understandably be substantial,” emphasises Keller. Explosions in refineries or on oil rigs are a threat to man and material. A defective blowout preventer with safety valves played a major role in the devastating catastrophe on the oil rig “Deepwater Horizon”, in the Gulf of Mexico. The valves malfunctioned, 780 million litres of crude oil flowed uncontrolled into the ocean, and caused several billion dollars in damages. Even more, eleven men died and 600,000 birds perished. Other sectors also place their trust in fire safe valves. Petrochemistry, for instance, where “filling processes of inflammable substances in tank farms” are usual, explains Vetec Ventiltechnik. In a critical situation, fire safe valves have to stand the test in real conditions, particularly in view of having to handle fast filling times. Vetec developed a rotary plug valve with a double excentric plug design, which ensures that there is no contact between plug and seat while rotating. No particles can adhere in between. “The housing is basically free of dead space, so no troublesome soot deposits can occur,” states Vetec. Fire safe valves also provide the chemical industry with much needed security. Ethylene oxide becomes highly flammable in contact with oxygen, reports Vetec. In an emergency, fire safe valves go through hell to keep the plant safe. Valves should not only have a fire safe design, but also be certified as fire safe. Here, fire safe testing facilities come into play. Specialised testing facilities leave nothing to chance and put valves through their paces. Take Amtec, for example. The company developed a new fire safe test rig to test valves according to DIN EN ISO 10497, API 607, API 6FA or API 6FB. 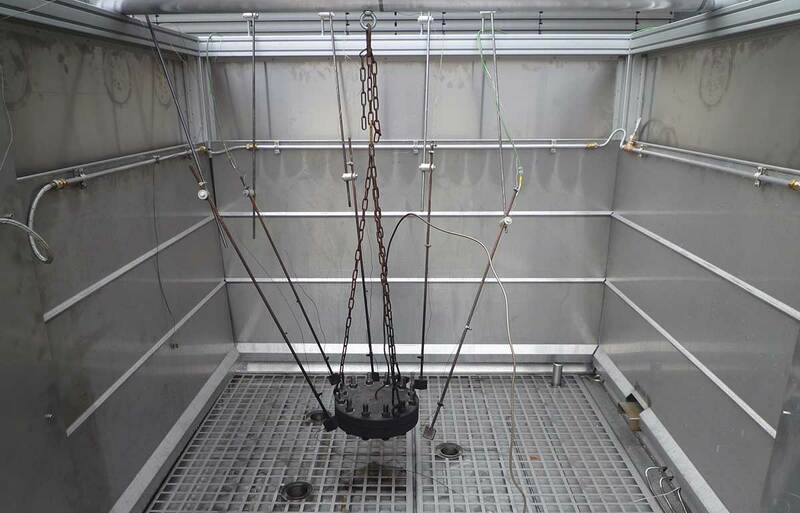 “With this test rig, all important type acceptance tests for fire resistance can be conducted,” says Manfred Schaaf, Amtec Advanced Measurement. Not only that: if needed, client-defined testing procedures can also be performed. This allows individual applications to be tested. Amtec’s test rig allows automated test procedures without manual intervention during firing and pressurising – for instance for regulating temperature and pressure. Ignition is automated, as well as the burner shutdown after the end of the firing period. Valve manufacturers are promised an improved repeat accuracy, a lower variation of temperature curves between tests and full compliance with norms. User-defined procedures are configured. And all of this with an increased level of safety, states Amtec: housing and burning chamber with window are closed, the flame is controlled, a pressure relief valve adds a further level of security. The housing temperature is controlled, including the automatic cooling system. The test rig is equipped with an emergency shut off function, turning off the burner and pump. The stresses a valve must withstand in the test rig also depend on the test standard. There are important main criteria: the valve must be able to resist interior pressure – depending on norm, valve size and type. Water is used as a medium. Firing lasts 30 minutes, the flame reaches a temperature of up to 1000 °C, and the housing temperature 600 °C. After the firing period, water is used to cool down the valve to 100 °C, over a period of ten minutes. Depending on norm, cooling can also take place using air. It is essential for the “leakage rate to comply with the specific norm,” emphasises Manfred Schaaf, Amtec. Packaging, housing seal and seat are viewed as critical. If a valve fulfils the leakage criteria set in a norm, the product receives a certificate: tested fire safe! Safety is too important for things to stagnate. “Due to changing testing requirements the test rigs have to be modified again and again,” states Manfred Schaaf. Investments are always required: just recently, the company put a test rig for cryogenic temperature applications into operation. Amtec is continuously expanding in the lucrative testing facilities field. Meanwhile, various testing facilities are available for testing seals, valves and stuffing boxes. Development of the fire safe test rig was, by the way, realised within a project supported by the Federal Ministry of Economics. A project with propelling Germany forwards. Various testing institutes in Europe already had individual test rigs, but the most important institute for fire safe certifications has so far been a testing laboratory in the USA. “With the test rig we developed type approval tests can now also be conducted here in Germany,” says Manfred Schaaf. “Valve manufacturers, or the customers, often want to attend tests, and this is now possible rather easily”. AS Schneider’s valves and valve blocks have championed the load tests in a test rig. Even after extreme test conditions, the certified valves not only showed themselves leakage-free, but could also be fully operated, as well as opened and closed repeatedly without problems. High-performance ball valves made by Hartmann Valves are another example in case. They can be operated in temperatures ranging between – 200 to +550 °C, pressure stages up to 700 bar and with aggressive media. Realised entirely in metal, the sealing systems between ball and seat ring fulfil a leakage rate of A, or 0. Special construction features and safety-oriented functions such as DBB (double block and bleed), DIB (double isolation and bleed) and fire safe create higher levels of safety. This is a necessity, as the ball valves are used with all kinds of media, from oil, natural gas, acid gas, brine, oxygen or hydrogen, steam, thermal water and abrasive or degreasing media. Ebro subjected its HP-300 valves to intensive fire tests complying with ISO 10497. The valves were placed under water pressure, the ISO norm demand 75 percent of the operating pressure. “The HP 300 was pressurised with an operating pressure of 37.5 bar,” states Ebro. Afterwards, the valve was fired with a propane gas, with temperatures reaching 650 to 1,000 °C. A condition which lasted 30 minutes, followed by a first leakage test. “Subsequently, the valve was quenched to a temperature below 100 °C and a second leakage test was conducted”. Ebro’s test objects were nominal diameters DN 80 and DN 200 in two different materials – CrNi steel 1.4408 and C steel 1.0619 – each with a full metal and laminated seal. “The tests were successfully completely, without any complaints”. Mission accomplished.